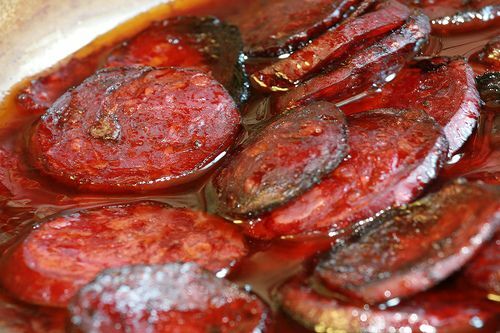 Chorizo, (shoreezo) I love it, the Iberian pork sausage given its distinct flavour and colour by its main ingredient Paprika, the best from the baking hot Extremadura region. In the time of the Crusades, the Christians used to use chorizo to distinguish themselves from the Arabs. Hence, it became customary to use a little chorizo in just about every pot, in case unexpected company came by. In all regions over Spain you will find that chorizo is a feature ingredient in all manner of soups and stews including the popular Paella (Pieaya), but what really gets my taste buds going is the way they do things in the mountainous regions. We frequented many off the beaten track hillside taverna with far reaching views. On Sunday lunch times it seems the whole village congregate here. Year round smoke billows in wistful clouds from the coals and vines that cook your mixed grill. Inside you’re greeted with the heady scent of fire, burning rosemary and the overhead hanging buts of the best dried Iberico pigs that previously gorged on acorns in the woods. An appetitive of the best sherry, or maybe a little walnut fire juice, a slice of dark plum red ham and maybe a few olives simply in olive oil, sharp and juicy, and all because you’re a bit of a novelty around here. Then for the meal, this time I only had 2 choices, fish or meat, and considering the distance we were from the coast it was a natural choice. I made the right one, a char grilled porky meat feast, succulent short ribs with a good portion of belly, huge whole chorizo and black pudding with a side of some of the crispiest most golden delicious chips (fluffy in the middle). Absolutely zero food miles and a tariff that would have only got you the warm welcome in London. One of the easiest things you can do with chorizo is finely slice (buy the uncooked one not the cured one) fry to release the juices not to colour then just add some large haricot beans and their juices, these will soak up the flavour of your chorizo, add stock and a dash of sherry or martini and let bubble for a few minutes, then pour into a bowl and eat with good bread.